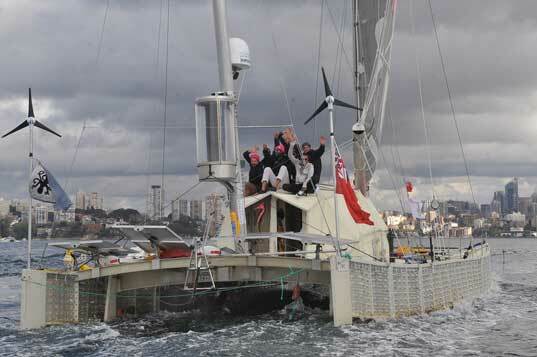 The Plastiki Bottle Boat Concludes 8,000 Mile Journey in Sydney, Australia! After 8,000 nautical miles and over 130 days of sailing the Plastiki finally reached its destination in Sydney, Australia this morning! The boat — made from 12,500 recycled plastic bottles — set out on its mission in March from San Francisco to help raise awareness about waste by sailing right through the Pacific Garbage Patch. The crew sailed into Sydney to meet a crowd at the Australian National Maritime Museum that had gathered to welcome them — the boat will be moored there on display for a full month. 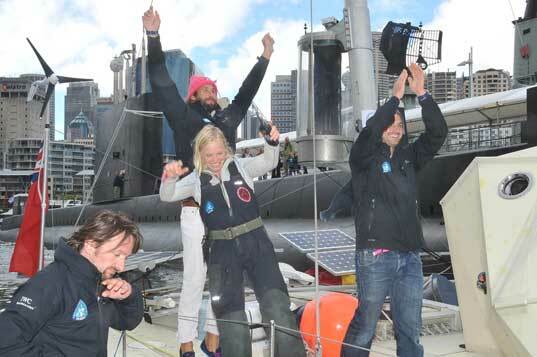 The elated crew stepped ashore in Sydney and vowed to keep their mission alive even now that their journey is over. The skipper, David de Rothschild — one of the heirs to the de Rothschild banking fortune — has said throughout their journey that his mission to reduce waste and increase recycling will carry on after the Plastiki has landed and has provided solutions for everyone to help out on the Plastiki website. They haven’t announced where their next move will take them, but they’ve made it known that they’ve got something up their sleeve. Stay tuned to see what stunt the Plastiki crew will pull off next. The Plastiki Reaches Its Destination in Sydney Australia! After 8,000 nautical miles and over 130 days of sailing the Plastiki finally reached its destination in Sydney, Australia this morning! The boat -- made from 12,500 recycled plastic bottles -- set out on its mission in March from San Francisco to help raise awareness about waste by sailing right through the Pacific Garbage Patch. The crew sailed into Sydney to meet a crowd at the Australian National Maritime Museum that had gathered to welcome them -- the boat will be moored there on display for a full month.